A woman who sculpted a future for herself by breaking all the rules. Hosmer’s favorite subject to sculpt was tragic heroines of history and myth. She certainly made Atalanta proud by getting a mountain named after her for winning a footrace to the top. She was a well-rounded athlete who began her sculpting career in a clay pit outside her house, making animals. The main obstacle in her career was her gender. For some reason, the East Coast did not allow women to attend anatomy classes. Not sure what their justification for this was, but sexists will be sexist. So she went to St. Louis and studied anatomy there. While there she met Charlotte Cushman, an actress well-known for playing male roles, who asked her to move with her to Rome. While in Rome she became a part of a sisterhood of sculptors and gained a reputation as the life of the party among Cushman’s circle of artists and writers. Cushman’s girlfriend was particularly fond of Hosmer and left Cushman for her. It was only a brief time later that she left Hosmer to return to Cushman, only for the pair to eventually break up for good. The actual love of Hosmer’s life was a widowed Scottish noblewoman named Lady Ashburton who she was involved with for twenty-five years. Ashburton lovingly referred to her as her “hubbie.” Though the two were happy, they never ended up settling down in a traditional sense. Hosmer was considered at the time to be an oddity because she lived alone, and rode on horseback without an attendant. She was a career woman who enjoyed her independence during a time when that was scandalous. Her sculptures proved to be so popular she was able to fully support herself with her art. Her masterpiece was Zenobia in Chains, an immensely tall sculpture that got lots of accolades and attention at the time of its release. Some sexists thought it so impressive they didn’t believe a woman could possibly have had the strength to create it. Hosmer was not about to take that. She wrote “The Process of Sculpture” for Atlantic Monthly, an in-depth step-by-step explanation of the entire sculptural process to disprove the false claims that she had male assistants do all the work for her. Later in life she even improved her process by developing a method of creating marble from limestone. Unlike another female sculptor, Niki de Saint Phalle, she did not shy away from the title of feminist. She was friends with Susan B. Anthony and her last commissioned art piece was for the Chicago group for women’s rights, the Queen Isabella Society. MacLean, Maggie. "Harriet Hosmer." Civil War Women. March 03, 2014. 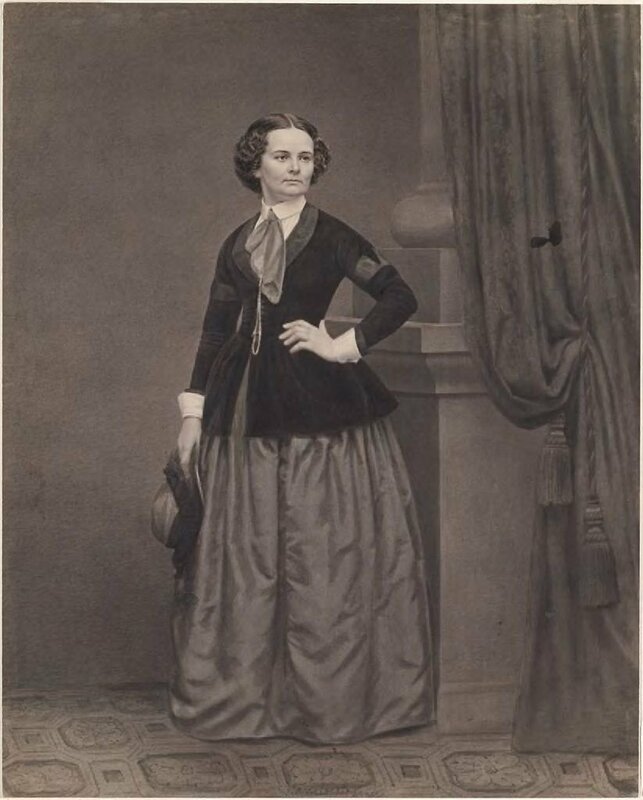 Accessed October 17, 2018. http://www.civilwarwomenblog.com/harriet-hosmer/. Harriet Goodhue Hosmer (October 9, 1830 – February 21, 1908) was a neoclassical sculptor, considered the most distinguished female sculptor in America during the 19th century. She is known as the first female professional sculptor. Among other technical innovations, she pioneered a process for turning limestone into marble. Hosmer once lived in an expatriate colony in Rome, befriending many prominent writers and artists. She was a cousin of poet William H. C. Hosmer and tragic actress Jean Hosmer. Check out the full Wikipedia article about Harriet Hosmer.